I never liked Little Brother…sorry, I just didn’t. I never thought they were wack, I just didn’t see the hype. Before I even heard a song I was hearing how they were the “saviors of hip hop”, how Pete Rock invited them up to the basement and how everyone from Primo to Questlove was co-signing them and when I finally heard “The Listening”… it was cool but to me it wasn’t anything mind blowing. And trust me, I KNOW that I’m in the minority with that train of thought but the one thing that was the bright spot for me in the group was one of the mc’s, Phonte. I don’t know how to explain it but dude just had “it.” I remember when BIG died and a lot of people were saying that Jay Z was gonna be the next “one” but in my eyes, Mos Def had all of the intangibles to be the next one. It was just something about Mos, he had everything you could want from a mc but of course Mos choose the Hollywood route banging out movies vs. dropping more Blackstarr and hip hop albums but the same way I felt about Mos back in ‘96, is the same way I feel about Phonte. Money is a star, point blank period. And not only is Phonte one of the nicest mc's in the game but now money has added singing to his resume and the bugged part is he’s dope at that too. So, 10 years after “The Listening” originally dropped, I’m FINALLY getting my wish for Phonte to drop that solo album and trust me, I’m ALL ears. From the door, Phonte’s comedic (Did I mention money is damn near a stand up comedian too?) side shines through on “Dance In The Reign.” Over an nice organ riff Phonte tells you so eloquently “and I don’t this all for hip hop…I’m lying like sh-t, I do this sh-t for my mortgage and my bills” and then goes on to tell you “I’m back in the kitchen with a silk apron, let that boy saute you.” “The Good Fight” reunites Phonte with 9th Wonder and has Phonte speaking on the hustles of life, “$5 gas and poverty rates/are rising much higher than your hourly rates/so if you thinking about quitting you should probably wait/cause everybody gotta do a f-cking job that they hate” and “Not Here Anymore” featuring Elzhi has two of the dopest mc’s in the game on the same track and has Elzhi doing what he does best, “I’m poetic while they pothetic/I’ll play their life like a movie/and in the end give them no credit/I was told to run it so I grip the baton/and spit magic like it’s pouring out the tip of a wand/don’t trip, you ain’t equip to fix your lip and respond/I plan to X you out like the man who hand you and script the Quran/since life flipped, I’m getting chips in Milan/pull dips, push whips like the ones in the clips of the Tron film. “Sending My Love” has ‘Te talking about the ups and downs of marriage and let’s us know that there’s nothing open at 4am except legs and hospitals. “Ball and Chain” and “To Be Yours” has ‘Te on his R&B jawn while “We Go Off” featuring Pharoahe Monch and “The Life of Kings” featuring Evidence and Big K.R.I.T. gets us back to the boom bap side of things. 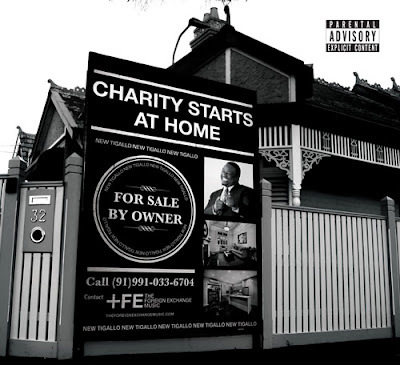 But the banger on “Charity Starts At Hone” that stays on repeat for me is easily the S1 and Caleb produced “Gonna Be A Beautiful Night” featuring Carlitta Durand…you can’t go wrong with that jawn at all. “Charity Starts At Home plays like the soundtrack of the working man’s life. Phonte finds a way to touch on the struggles that we all face on a daily basis, trying to balance love and life and does it in a way that will make you laugh, cry and nod your head all at the same time. My only beef with the project is I felt the some of the production could’ve been tighter. I totally get that the whole 9th Wonder/Phonte reunion was a big deal for all of the Little Brother fans out there but I would’ve loved for Phonte to venture out and grab some other production to round out the project better. But at the end of the day, Phonte helps to dead my dude Sonny’s philosophy from the “Bronx Tale” that the working man is a sucker cause just like Deniro had to school Calogero and let him know that the working man is the real tough guy, Phonte is telling us the exact same thing.